We advertised titles on 900 occasions last year with the magazines that we work most with – who review our books, take articles from authors. It's more of a quid pro quo than in expectation of results. Our experience is that advertising individual titles has little direct effect on sales. By that, we mean any more than a handful or so of copies. Where it does have an effect, it is in conjunction with a reader offer or similar. The more closely the book is linked to the magazine’s constituency the better – putting an ad in the New Yorker or the Times is a waste (we have tried it). Print advertising has virtually disappeared from most publishers’ marketing budgets. What remains in them is increasingly directed towards online ads and campaigns. Research suggests that three times as many book buyers are made aware of titles through online/internet advertising than TV, radio, newspapers and magazines combined. As an Amazon Vendor we can participate in Amazon Marketing Services in the UK only at present. Sponsored Products – These keyword-targeted ads appear on related product detail pages, below and on the right rail of Amazon.com search results. You only pay when shoppers click your ads and can get started with a daily budget as low as £1. Headline Search Ads – These keyword-targeted ads appear above Amazon.co.uk search results with a custom text headline. You only pay when shoppers click your ads and can get started with a campaign a daily budget as low as £1. Product Display Ads – These product- or shopper interest-targeted ads appear on related product detail pages with a custom text headline. You only pay when shoppers click your ads and can get started a daily budget as low as £1. We do this work at our own discretion. 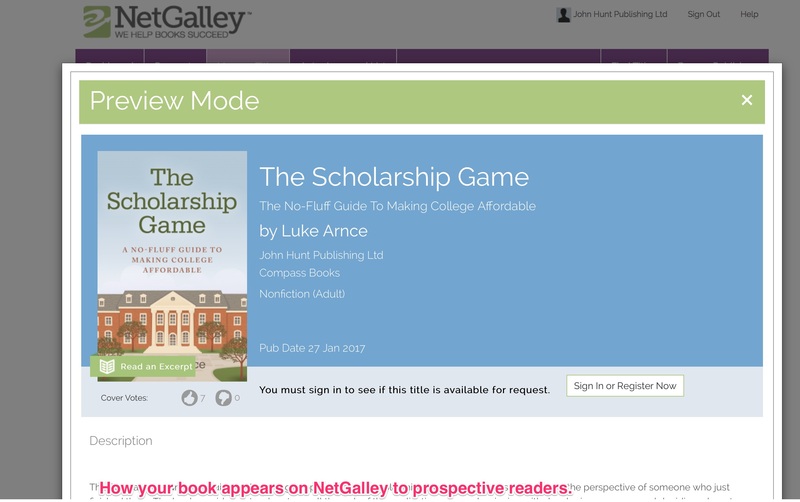 We also use NetGalley, an online platform that enables professional readers to download ebooks for free, in order to review them. Readers vary from bookshop owners and teachers, to journalists and popular bloggers. This is a significant service used by many of the leading publishing houses. At JHP we pay for 20 titles on NetGalley at any one time. Titles get selected for NetGalley via two different ways. Authors who pay for extra publicity are guaranteed time on NetGalley for at least six weeks. As each new title is assigned a contract, we will decide whether a title would benefit from a spell on NetGalley and add it to the title's AI. ·If for any reason there are spare places going, then we will select a title from the upcoming releases over the next few months. Generally 5-7 new titles are archived (taken off) NetGalley each month, and 5-7 titles added. Each title is on for an average of 2 months. When the title is submitted, and goes live on Netgalley a notification is sent to the author (mktg_advertising: advertising activity completed). A marketing activity will be entered as ‘Advertising’ and the dates shown in ‘Offered’ and ‘Completed’ are the dates when the title will be live on NetGalley. Request that the reviewer post to Amazon or Goodreads if they haven't already. Enter the review as a marketing activity under ‘Review Copy’. We don't usually produce video trailers ourselves and while a few of our imprints do have YouTube channels our aim is not to "go viral" or gain massive sales with the videos on a book-by-book basis, but to find our audience on several channels and gain attention for the imprint as a whole. Singular and isolated book trailers don't often help sales. Example of one of our authors trailers: https://youtu.be/EXqEjUNqsOw. Instead of producing our own book trailers we much more often will seek out relationships with youtubers and other "content creators" online and we would encourage you to reach out to online programs or channels if you think they would be interested in your book. If you elect to produce your own video or the book is promoted on an established channel enter this as an “Advert” in the “Activities” section on your Marketing page and include the link to it in the details box. Alert us to it through the forum and Facebook and post the link far and wide. We would also advise authors to get involved with our social-media activities (see Chapter 12), where you can share updates about online videos, podcasts, blog posts and interviews while interacting with our readers. Appearing as an expert guest on podcasts is an effective way to get attention for your book. We advise that you search for podcasts that seem relevant to your book on itunes and then consult our contact database. Even the smallest and most obscure podcasts tend to find their audiences. There are podcasts that focus on old television programs, alternative forms of spirituality, wood working, bridal bouquets, and even books. Listeners to these shows are devoted to these subjects. This means that podcasting, rather than being a way to mass market a book or product, is instead a form of engagement marketing. Podcasts are a way for you to find the people most interested in what you're doing, and since podcasts are "time shifted" rather than scheduled podcasts listeners fit their favorite programs into their own schedule and tend to give these shows more undivided attention. (Here's a link to an interesting infographic about podcasting created by the podcasting advertising company "Midroll": http://awesome.midroll.com/). Podcasting should be considered as a form of social media. Appearing as a guest on podcasts is a way to develop new relationships and growyour network of influence. When you're finding podcasts within your niche take the time to listen to a few. The ones you like the most should be the ones you contact first and the ones where you'll likely have the best conversations. Zero Books runs regular podcasts on its FB page. When you do appear on a radio show, TV show, workshop or podcast, don’t forget to add this to the Marketing Activities so that we can let our industry followers and readers know about your appearance. In the past our authors have appeared on podcasts such as New Books in Critical Theory, the C-Realm Podcast, the Alpha to Omega Podcast, and PopMatters. When we hear from authors about their media appearances we are quick to share the link with our Facebook and Twitter followers as well to include the link in newsletters and updates to vendors.